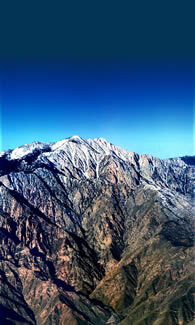 Chino Canyon and Snow Creek Canyon are alluvial fans that were formed over thousands of years by periodic torrential rains and violent floods rushing down from the San Jacinto Mountains. These deluges cut deep canyons that eventually broaden into floodplains covered hundreds of feet deep with boulders that were deposited over time. 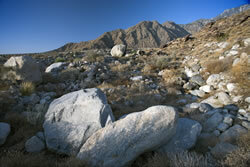 These boulders, many the size of houses, trap sediments that purify snow and rainwater runoff, and channel water directly into the aquifer which supplies precious water to much of the Coachella Valley. The floods that created this landscape continue today. Building and paving over significant portions of Chino Canyon and Snow Creek will drastically impact this natural filtration system, polluting the water and causing greater potential for flooding and erosion. Plants that grow in the the sandy soil of alluvial fans also play a major role in flood control. Root systems, frequently extensive and deep in desert-adapted plants hold the soil together. Leaf cover and litter can also reduce the force of rain hitting the soil, further delaying erosion. As sand is washed away through erosion, larger rocks and boulders become unstable, particularly during floods. Although the threat of flood may seem preposterous in a desert environment currently suffering from extended drought, the potential for flooding and the resulting debris flows is very real. As recently as 1985, 3/4 of a mile of the Tram Road wash washed away in a flash flood. Stranded Tram passengers, whose cars were buried in mud in the Tram parking lot, were airlifted to safety. Flooding of the Whitewater River in 1938 left Palm Springs stranded for a week, with multiple fatalities. In 1965, Cottonwood Creek overran Interstate 10 and washed out sections of Highway 111, also with fatalities. In fact, flooding poses such a grave danger that California Governor Arnold Schwartzeneger has convened an alluvial fan taskforce to protect against deaths and damage caused by building in alluvial floodplains like Chino Canyon.